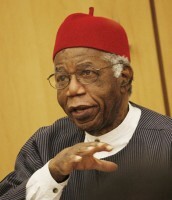 It's been a year exactly, March 21st 2013, since the world woke up to the news of Chinua Achebe's passing. For me personally it was a day of great sorrow for one is never really prepared for the death of a beloved one. In that year a lot has happened as time has rolled on relentlessly. There’s an adage that declares that death is final, but is it? In the movie Gravity George Clooney playing the astronaut Kowalski declares back to earth with some desperation after some heart stopping moments in space, “Here’s hoping you have insurance Houston – damages to Explorer catastrophic.” I said something similar, or at least thought it, a year ago. Nigeria had lost one of its most salient and insistent voices – quiet but with the reverberations of thunderclaps and potencies of prophecies. But I think my pessimism may have been premature because his heirs both political and literary have continued the fight in the different arenas that mattered to him. Yes, Achebe lives on indeed! Importantly too his book Arrow of God came of age this year celebrating a half century. While Things Fall Apart is regarded as his magnum opus, there is no doubt that Chinua Achebe himself had a special love for Arrow of God. In the preface of the second edition he declared, tongue in cheek no doubt, that no pater familias worth his salt would be so unwise as to choose favorites amongst his offspring. However, he did say that it was the one book more than any other that he was likely to be caught reading. I know what he meant. It was also my own favorite too until I met and fell in love with his 1987 Anthills of the Savannah and never looked back. Many events have been slated all over the world this year to celebrate this true literary masterpiece. On a more personal note of course his loss is still hard to bear but must be accepted. Chinua Achebe was here for a purpose which he clearly fulfilled and has moved on. It is left for his millions of heirs to take up his battle cry. Ngozi Achebe is a writer and niece of Chinua Achebe. Her debut novel is Onaedo- The Blacksmith’s Daughter. She is also a practicing medical doctor in the United States of America. She can be reached on Facebook or on her publisher’s website ngozi-achebe.com to follow her ongoing projects.